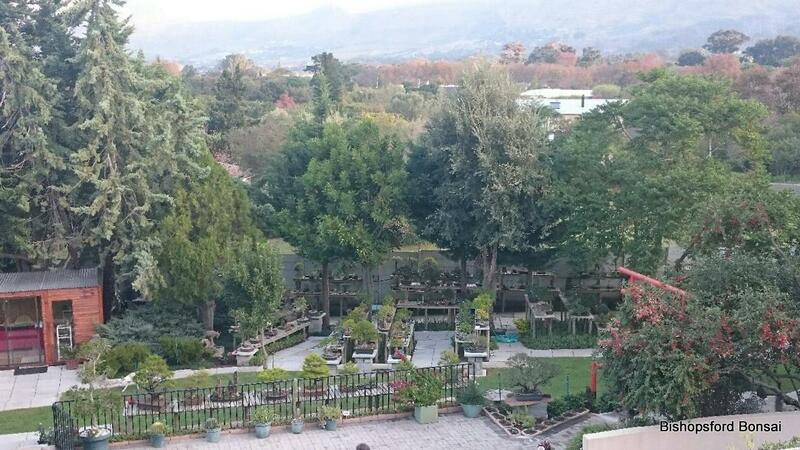 The biggest bonsai nursery in the Western Cape is situated in Constantia. Bishopsford offers a large selection of ready made Bonsai and also stock all bonsai requirements such as pots, tools, soil, mesh, starter trees, fertiliser, pestcare and penjing. With over 47 years of Bonsai experience, we offer Bonsai courses and services such as repotting, pruning, boarding, bonsai corporate gifts and anything you need that is bonsai related. Pay a visit to our beautiful garden in a magical setting. The nurturing of these little wonders of nature has become a passion and way of life and, for us is certainly food for the soul. Sharing knowledge and experience and watching new bonsai growers develop is an added joy. Hopefully a stroll amongst the trees will fill you with a sense of peace and tranquility. So if you are looking for a big selection of Bonsai trees, pots, tools, wire, soil, fertiliser, pesticides, starter trees, rocks, gravel, mesh and all other Bonsai requirements in Cape Town why not pay us a visit. We are open 7 days a week from 9am to 4.30pm. Curated content from Chas Everitt Cape Town South promoting our area.